Continued from our earlier piece on the Marx Brothers’ vaudeville and Broadway career. 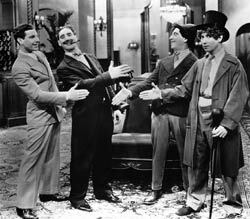 The Marx Brothers launched their film career fortuitously, with five strong, characteristically zany comedies for Paramount: The Cocoanuts (1929), Animal Crackers (1930), Monkey Business (1931), Horse Feathers (1932) and Duck Soup (1933).As happened with the Beatles much later, without the glue of live performance to hold them together, the group began to drift apart. Now living in Hollywood with a lot of free time on their hands, they each began to follow their own pursuits and to socialize less with one another. The first of the brothers to decide that life outside of the comedy team was possible was the one who’d been drafted against his will to begin with. Over the years, Zeppo had gotten tired of living in the shadows of his three brothers. What made the situation particularly nettlesome was that (believe it or not) he was as talented as any of them. Offstage, he was known as the funniest brother. Socially, he was the one who could kill everyone at a party with a joke. Once, when Groucho had been confined to the hospital for an emergency appendectomy, Zeppo had understudied for him, and the audience never noticed the difference. But he was ten years the junior of three show business giants. No one gave him the slightest opportunity to prove himself on stage or screen, and he was too intimidated to make his own opportunity. His record on celluloid consequently is pretty embarrassing. In any given picture 3 or 4 supporting players have a better part than he has. Unable to take it any longer, he quit the group in 1934 to become their manager. Despite the fact that in 1933 they were Paramount’s 5th largest grosser, and that the previous year they had made the cover of Time magazine, the studio did not renew their contract. (Paramount was uniquely myopic about its comedians. They later did the same thing to both W.C. Fields and Mae West). Fortunately, Chico was able to land them a much better deal at MGM. There, they started out strong with A Night at the Opera (1935), but the quality of each succeeding film worsened geometrically, with A Day at the Races (1937), At the Circus (1939), Go West (1940), The Big Store (1941). The MGM machine didn’t understand, and didn’t care to understand, their characters. Nor, it seemed, did the brothers themselves, based on their 1938 loan-out to RKO Room Service, a stage play largely unsuited to their special talents. The most intriguing offer that came their way in these years was called Giraffes on Horseback Salad, a surrealist screenplay sent to them by Salvador Dali. Groucho said the script “wouldn’t play”, but there’s little doubt that it would have been a better choice—as nonsensical as it was—than the schlock that characterized the remainder of their film careers. 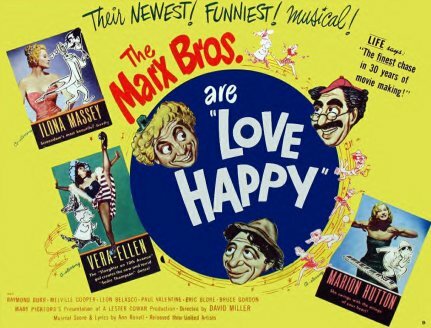 Their last film together Love Happy (1950) ranks with Laurel and Hardy’s Utopia as one of the saddest swan songs in cinema. Fortunately, there were other outlets. The team’s first foray into broadcasting, the radio show Flywheel,Shyster and Flywheel had lasted only the 1932-33 season. Groucho tried and failed several different radio ventures before finally hitting one that was to make him a star yet again. His game show You Bet Your Life was a hit on radio and then television all through the 1950s, making Groucho as indispensable a presence in American living rooms as Uncle Miltie. His brothers did not fare as well on their own. Chico had his own swing band that played the night club circuit. He died broke, having gambled away all his money, in 1961. Harpo enjoyed a sort of pseudo-retirement, doing occasional solo turns on shows such as I Love Lucy. His last public appearance, at which he is reported to have spoken in public for the first (and last) time since he played Patsy Brannigan was in 1963. He died the following year. Groucho lived long enough to enjoy resurgence of Marx bros popularity during the hippy era, and even starred in a psychedelic film (Skidoo, 1968). He toured college campuses where he was the darling of radical youth. In 1972, he caused a big stir when he stated publicly that Richard Nixon should be assassinated. That year he performed at Carnegie Hall to sell-out crowds. Both he and Gummo passed away in 1977; Zeppo followed in 1979. Another fine article. I knew a good bit ot it but always learn something new. You mentioned Chico dying broke and it reminded my of the story where someone asked him how much money he lost gambling over his career and his answer to them was to find out how much money Harpo had. Your comment regarding Room Service reminded me of Groucho telling someone “I had no character as a Marx Brother. I just talked fast, and the jokes had better be good”. Had no character? No wonder he let himself get kicked down the stairs!